The Timberline Queen Bedroom Group by Signature Design by Ashley at Del Sol Furniture in the Phoenix, Glendale, Tempe, Scottsdale, Avondale, Peoria, Goodyear, Litchfield, Arizona area. Product availability may vary. Contact us for the most current availability on this product. Drawer Suspension Side roller glide drawer system offer durability and smooth and easy movement of drawers. Drawer/Shelf Construction Numerous drawers and shelves provide ample storage options as well as durability for extended usage. Finish A rich warm Timberline Cherry finish creates a homey and pleasant atmosphere in your home. Case Details Simplistic moulding, decorative fretwork and curved aprons create a harmonious look and feel. 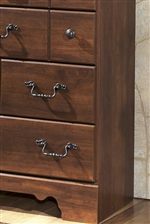 Handles & Hardware A variety of decorative metal hardware pulls grace drawers and doors. 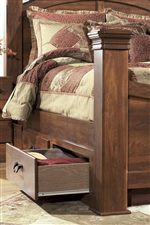 Timberline grasps the true beauty of country style bedroom furniture and brings it to your home. Featuring a simplistic approach to design, sweet, straight lines are contrasted artfully with soothing and curvaceous forms to create a charming and tranquil atmosphere in your home decor. 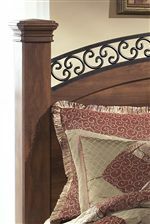 The replicated brown cherry grain introduces a homey and cheery look and feel and is beautifully accented by the nicely scaled fretwork on the arched style of the headboard and mirror. Simple, but never ordinary, a variety of decorative metal hardware add visual interest and design value. With such a pleasant and wholesome appearance, Timberline induces sweet dreams and slumberous rest with its rich country style. The Timberline collection is a great option if you are looking for Cottage furniture in the Phoenix, Glendale, Tempe, Scottsdale, Avondale, Peoria, Goodyear, Litchfield, Arizona area. Browse other items in the Timberline collection from Del Sol Furniture in the Phoenix, Glendale, Tempe, Scottsdale, Avondale, Peoria, Goodyear, Litchfield, Arizona area.